Denzel Washington’s son John David Washington stars in the true story of an African-American cop infiltrating the Ku Klux Klan in 1972. WASHINGTON — Spike Lee’s dynamite new movie is making some noise at the box office. The daring film “BlacKkKlansman” blends moments of biting comedy with horrific social commentary, joining “Blindspotting” as one of the most powerful experiences of the year. Inspired by an incredible true story, the film follows African-American cop Ron Stallworth (John David Washington), who infiltrates the Ku Klux Klan in Colorado Springs, Colorado in 1972. Rather than going under the hood like Dave Chappelle’s Clayton Bigsby, Stallworth convinces his boss, Police Chief Bridges (Robert John Burke), to launch a unique investigation. 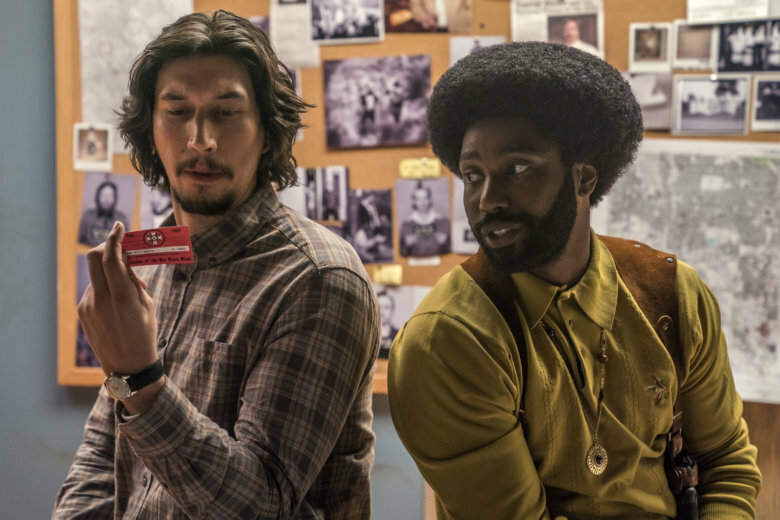 While Stallworth places disguised phone calls to KKK grand wizard David Duke (Topher Grace), white detective Flip Zimmerman (Adam Driver) plays his alter-ego in person, going undercover and wearing wires to record the various Klan meetings. Along the way, Stallworth falls for Black Power activist Patrice Dumas (Laura Harrier), who soon suspects his scheme. Twenty-six years after directing Denzel Washington in his iconic biopic “Malcolm X” (1992), Spike Lee casts Denzel’s son John David Washington. Not only does he boast his own unique brand of charisma, if you close your eyes during certain scenes, the younger Washington sounds exactly like his pops. It’s almost a bit freaky how closely they resemble each other. Elsewhere in the police department, Adam Driver shines as the white detective tasked to play Washington’s proxy. Several scenes are laugh-out-loud funny as the duo compare voices in an attempt to audibly match, while other moments punch us in the gut as an emotional Driver admits that he never thought of himself as Jewish until enduring the wrath of the Klan. On the Klan side, Topher Grace kills as David Duke with a chilling matter-of-factness to his bigotry. On a local level, Jasper Pääkkönen is authentically sadistic as the main antagonist, Ashlie Atkinson is fittingly unlikable as his overeager wife Connie, and Paul Walter Hauser steals the show as the dimwitted Ivanhoe. Rounding out the racists is Alec Baldwin as an Alex Jones-style talking head in a subversive bit of casting meant to conjure “SNL” memories. The 61-year-old Lee shows the full potential of his directorial prowess, appearing re-energized by recent political events to deliver his most inspired “Spike Lee Joint” in years. The director’s eye shines during a Black Panther speech by Stokley Carmichael (Corey Hawkins), spotlighting the individual faces of the inspired crowd. We also get such auteur staples as the “floating dolly shot,” as cinematographer Chayse Irvin (Beyonce’s “Lemonade”) shows characters floating down the hallway toward a Klansman with a burning cross reflection in his eye. It’s all backed by the powerful guitar of Terence Blanchard (“Inside Man”). Still, Lee’s most powerful touch is his use of archival footage, opening with the Confederate crane shot of Victor Fleming’s “Gone with the Wind” (1939), climaxing with the blackface of D.W. Griffith’s “The Birth of a Nation” (1915) and ending with real-life footage from last year’s deadly white supremacist rally of neo-Nazis and KKK members in Charlottesville, Virginia. Ten years ago, during our optimistic delusions of a “post-racial America,” we might have naively called such a movie “over-the-top” in its social commentary. Detractors might have even called Spike paranoid. But arriving the same week as an actual white-nationalist rally on the National Mall marking the anniversary of Charlottesvile, it’s horrifically spot-on. As an American flag appears upside down at the end credits, fading from red-white-and-blue to a symbolic black-and-white, Spike throws up a distress signal for the nation. He calls out the cowardice of saying there are “good people on both sides” of KKK rallies. Frankly, my dear, the president is etched in time saying it, stamped like a birth certificate. At least there’s hope that the country can change with enough “good people on both sides” of a movie screen.